I love this butterfly set from Art Neko, which comes as a set of 3. The other 2 are inside the card. The background paper is also from Art Neko and I thought it was perfect to use with my butterfly. I made a frame from for the paper which hides the glue and makes my card nice and neat. I heat embossed and painted the butterfly using my Zigs. All 3 butterflies are done in different colours. I styled the butterfly and attached on foam strips along with some glossy accents glue to be sure it was secure. I then stamped my sentiment and heat embossed in the silver and painted with my Zigs. I did not have a tag that would fit my sentiment properly, so I just trimmed it to fit where I wanted it placed. A few sequins to give my butterfly some company ... thanks for having a look today. 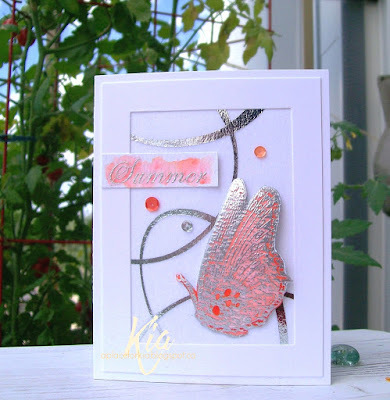 Products: Art Neko Butterflies Set of 3, Art Neko Summer Sentiment, Art Neko Polyester Fabric Paper, Spellbinders Card Creator Matting Basics, Kuretake Zig Clear Colour Brushes, Silver Embossing Powder, Neenah Cardstock, Watercolour Paper, Sequins. 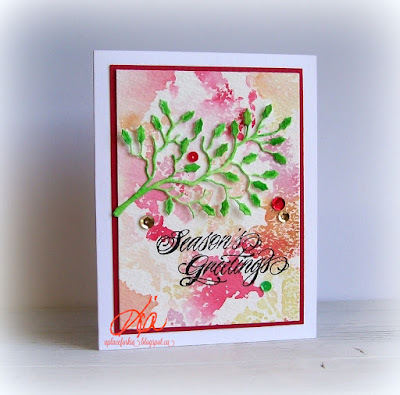 I am hosting the Clean and Simple Challenge at Splitcoaststampers today, and as it is July 25th I thought it only appropriate to get a jump on Christmas cards. So many of us procrastinate every year, so today is a chance to change that. 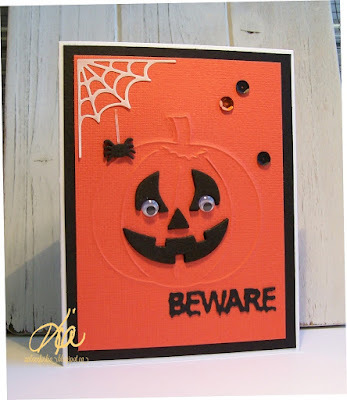 For myself, I like to donate cards every year so I need to get started on this part of my card making. This card came about as I had a mess of ink on my craft mat, so rather than waste it, I put my stencil down in it and transferred the ink to a piece of watercolour paper. It did not take on the stencil design like a monoprint would, but it has bits of the design in it. I think it created an interesting background to use for my card. I die cut the branch and coloured with Zig brushes in an unexpected green colour and sprayed with glimmer mist. I could have used a darker green ~ maybe it is the July part that had me picking the lighter green, but I kind of like it. A few sequins to finish. Thanks for having a look today. Products: Memory Box Holly Branch, Penny Black Christmas Cheer, Tim Holtz Holly Bough Stencil, TH Distress Inks, Kuretake Zig Clear Colour Brush, Glimmer Mist, Sequins. I really had a difficult time getting a picture today and I think it is due to the weather. The humidity is just hanging in the air today, so I took it outside. I am getting a jump on Christmas, even though it is only July. I want to donate cards again this year, so there is no time like the present. The inspiration for this card came from my fellow design team member at Frantic Stamper Jen Carter and her card here. I kept the layout and star theme of Jen's card, but changed it up for a Christmas Card. On the stars I painted Glimmer Mist, but it is so difficult to capture in a photo. It is very pretty in real life. Thanks for having a look today. 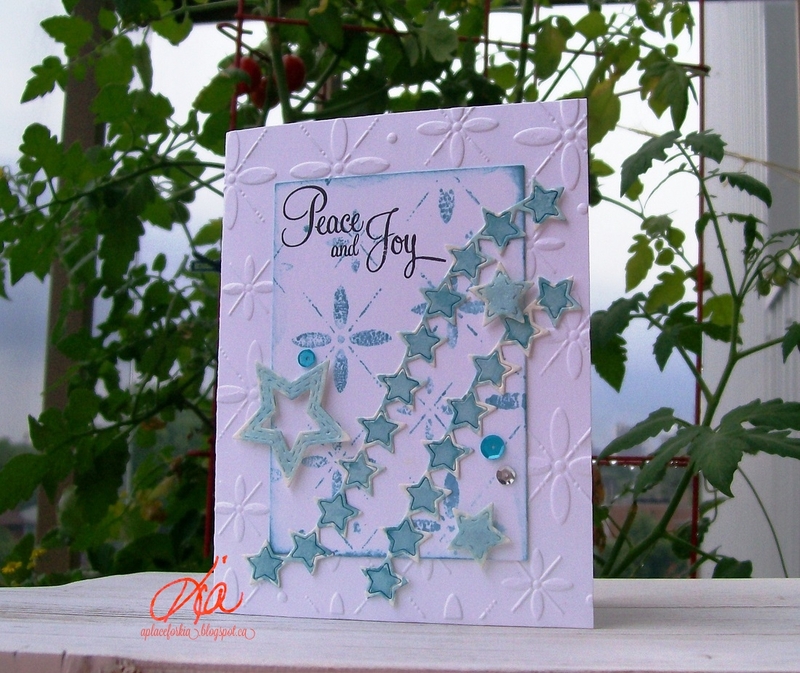 Products: Frantic Stamper Dies - Wavy Stars Edger, Nested Stitched Stars and Small Stitched Stars; Sizzix Winter Set #2 Embossing Folder, Penny Black Christmas Cheer. Anyone interested in a little sunshine? When I saw last week that the challenge for today's Clean and Simple challenge at Splitcoaststampers was to use a sun in our design, I was a bit stumped as I don't have any sun stamps, nor dies! I have no idea why either. So I thought I would use a flower for my sun, and I had the perfect flower to use. I heat embossed my sunflower with gold embossing powder. 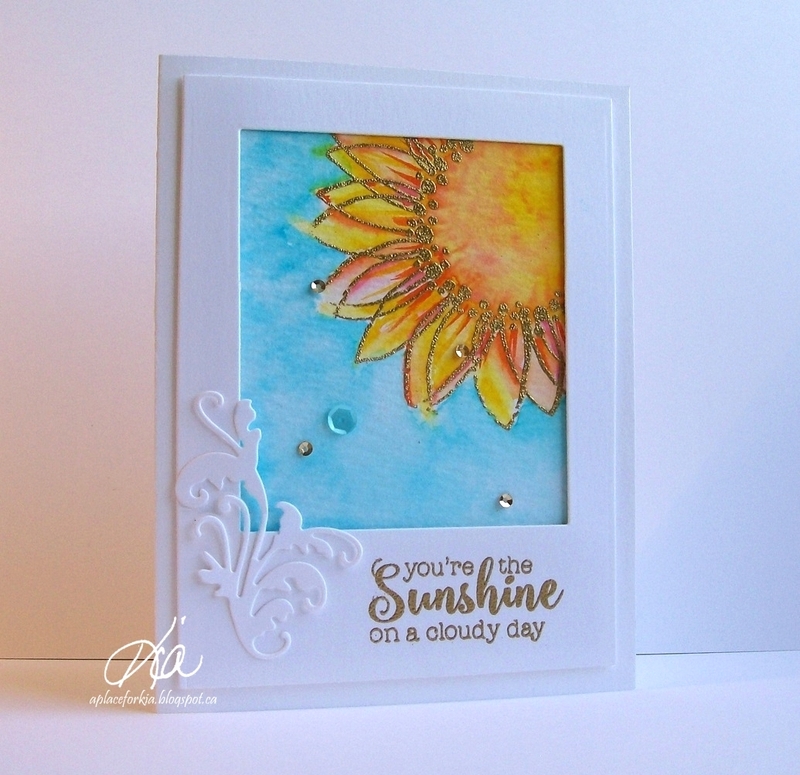 Before heat embossing I broke the tip join in a few of the sunflowers to get that open feel. I then painted using my Kuretake Zig Clean Color Brushes, adding colours to the centre to get that intense heat of the sun look. I heat embossed my sentiment on my photo frame and attached using foam strips, and added a flourish die to the side which is to represent the dance the earth does when the sun reaches it. 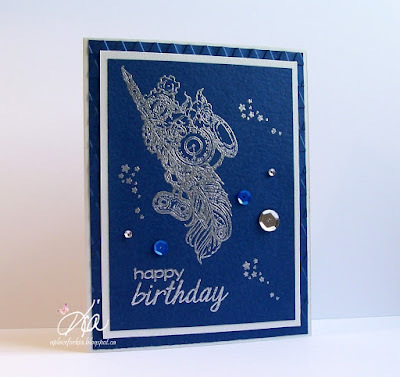 A few sequins in gold and a touch of blue finished my card. I had a lot of fun doing this card and I hope you enjoy it as well. Products: Stampendous Sunny Flower Set, Stamplorations Fond Expressions 2, Frantic Stamper Instant Camera Photo Photo Card, Penny Black Bookmark, Gold Embossing Powder, Kuretake Zig Clean Color Brushes , Cupped Gold Sequins, Sequins. I had a difficult time getting this picture today given it is overcast, so please forgive me. I have had the Kuretake Zig Clean Color Real Brushes on my wish list for a very long time and finally fulfilled part of that wish receiving the 48 pack yesterday. I did a lot of research and watched many a video on these before investing in them, and they are everything I thought they would be. I'm in love - yes, with these brushes. 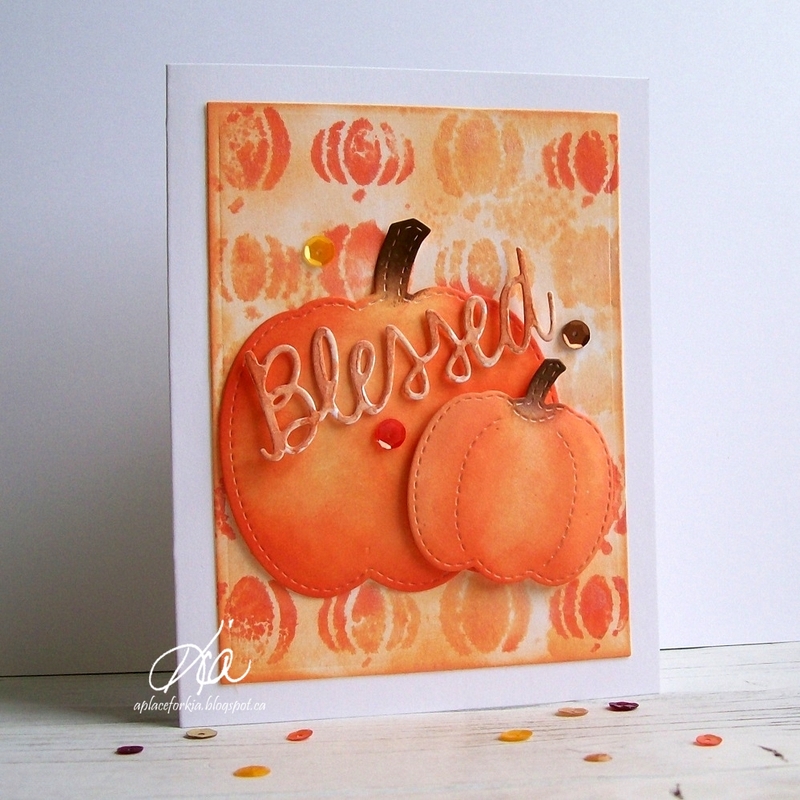 For this card I stamped and heat embossed my image on watercolour paper with white embossing powder before painting. I layed down the Zig colour and blended with my aqua brush. I wanted a bit of colour around the image, so I did a doodle frame using a Sharpie Permanent Marker. 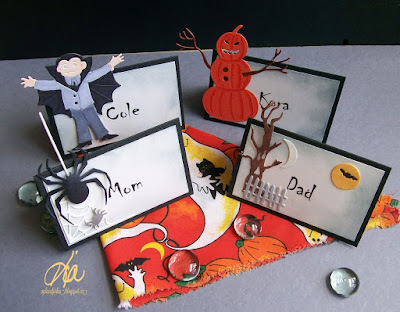 I die cut the hugs and painted with the red, adding a few layers to get the dark rich colour. A few of my trademark sequins finished my card. Thank you for having a visit today. Products: Stamplorations Framed Dahlia, Simon Says Stamp Big Hugs, Kuretake Zig Clean Color Real Brush, Sequins, Crystals, Sharpie Fine Line Marker. 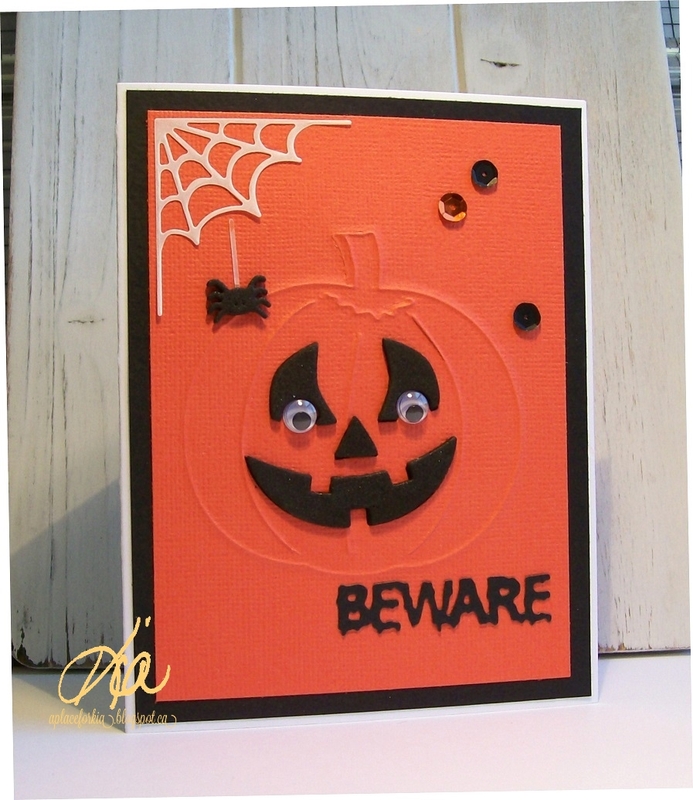 I have a card to share with you that I made for a customer. I like making cards for this customer as she does not follow rules with the cards she wants. 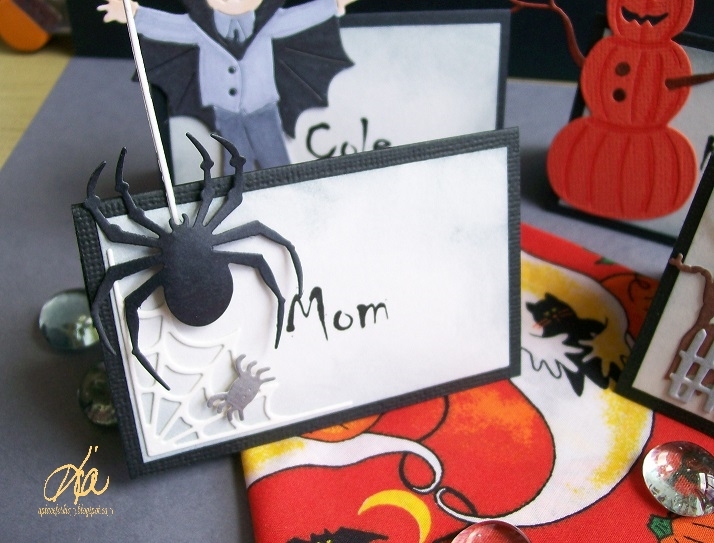 She wants handmade cards that are made for the person she is giving them to, and that makes it so much fun. I coloured this with my prisma pencils, and so enjoyed the quiet time I had with this image. The description of the little boy this is for is said to be "very colourful", and he will be 5. Giggles ... so it seemed fitting that colour be used in different ways on the card. I think when we were kids we coloured without barriers, so that is what I did here. 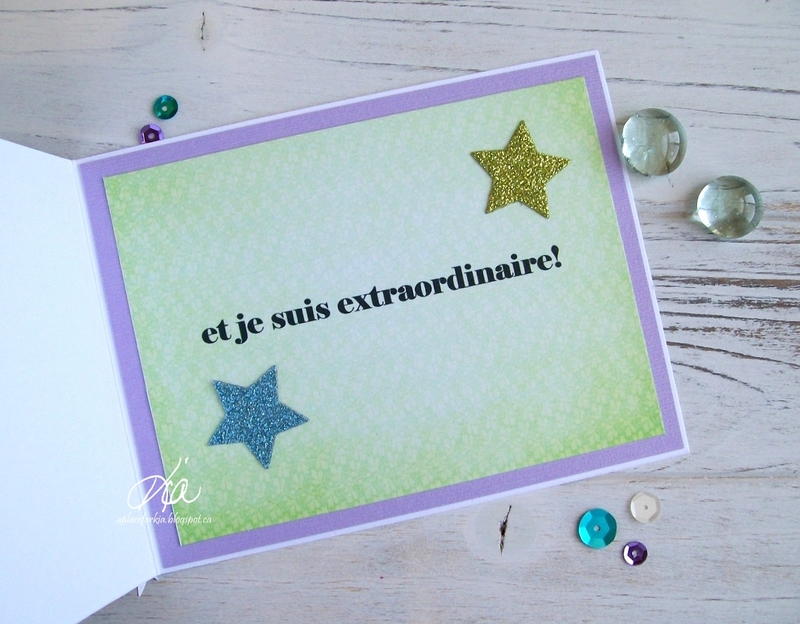 For added sparkle and interest I die cut the wavy stars edger out of glitter cardstock. 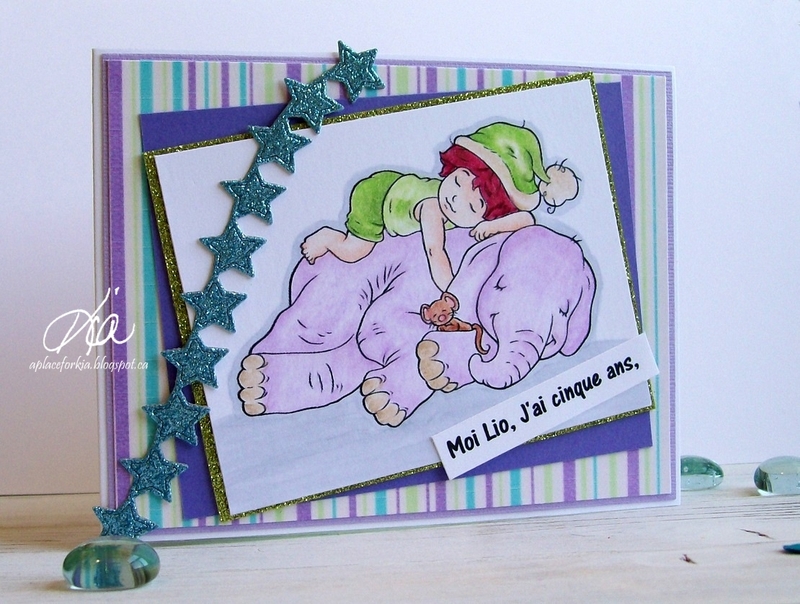 Products: Nap Time Stamp, Frantic Stamper Wavy Stars Edger, Cuttlebug Star, Prismacolor Premier Pencils. Hello everyone. This is my first card for the Design Team of Art Neko. 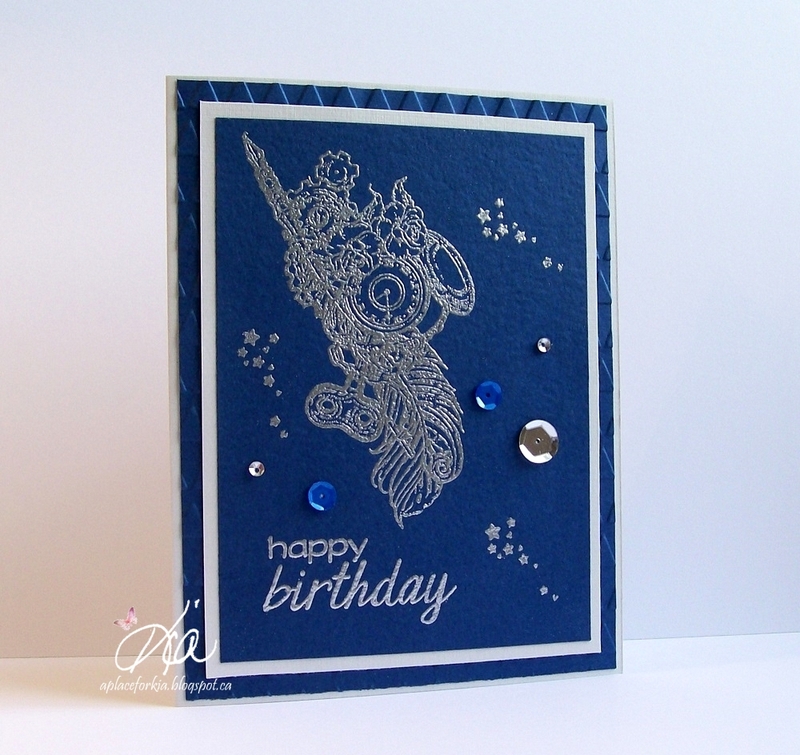 I used Steampunk Feather for this birthday card, which I think makes a great guy card. I heat embossed using extra fine embossing powder to ensure that every detail would show. I have a couple layers of matting, the bottom matting is embossed for some added textures in the matting. 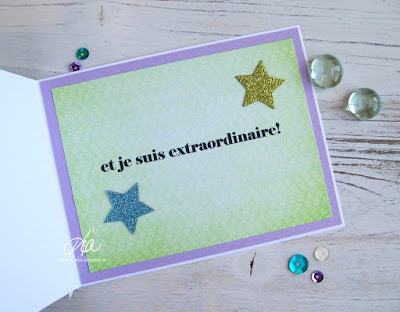 A birthday sentiment, some stars and of course my trademark sequins complete my card. Yes, even guys like a bit of bling, as long as it is not pink, or so I am told. I really like how it turned out, and thank you for having a look. Products: Art Neko Steampunk Feather, Frantic Stamper Celebrations, Echo Park Mini Triangles Embossing Folder, Martha Stewart Extra Fine Embossing Powder, Sequins. I had such fun preparing for this week's Clean and Simple Challenge where fellow design team member Kathy asked us to play at the beach. I had just watched a video on this technique on Youtube, so of course I had to give it a try. I can't tell you how much I enjoyed myself. I used 5 different colours of ink for my background, which represents where you find the lobsters, not the colour of the lobster for those who wonder. Once I finished sponging on the colours, I used my paint brushes and splattered the background with water and used a paper towel for excess, then immediately covered the background with embossing powder. You do not use embossing ink, the powder attaches itself to everywhere there is no water, and I heat set it in place. And yes, be prepared - some sparkle flies off the page before being heat set - oh the joy of making a mess! For the top panel it is simply repeated die cutting. In the video here Yana used a smaller starfish. 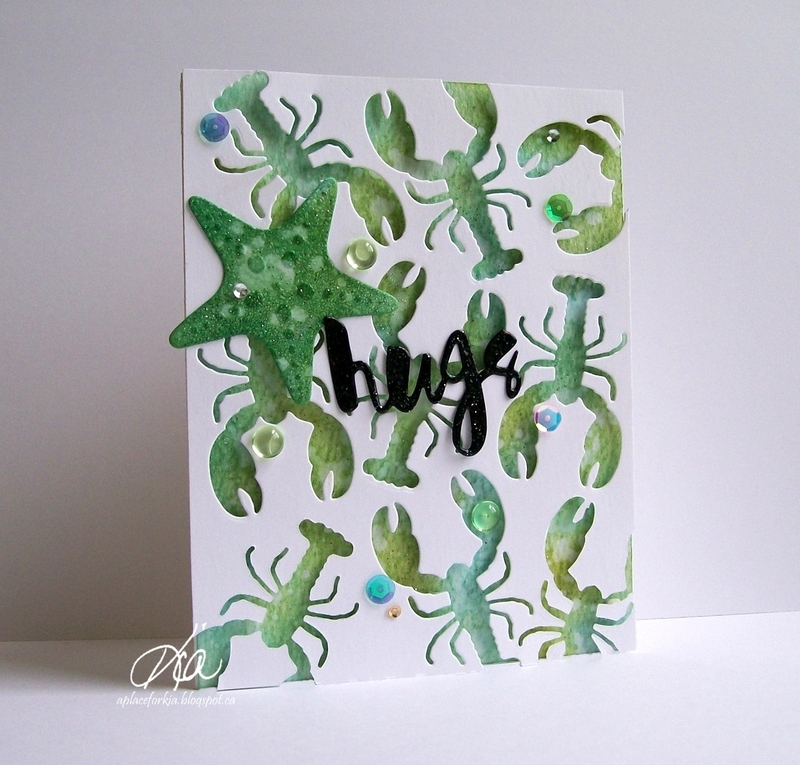 I wanted to use my lobster as I thought the die had a lot of interest when used for the negative. 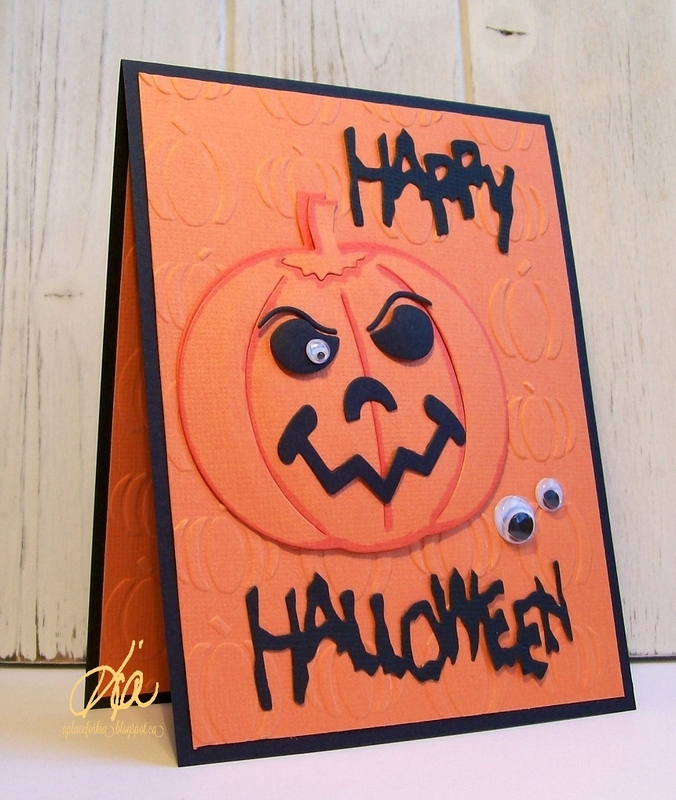 The panel is attached to the card base using foam dots. 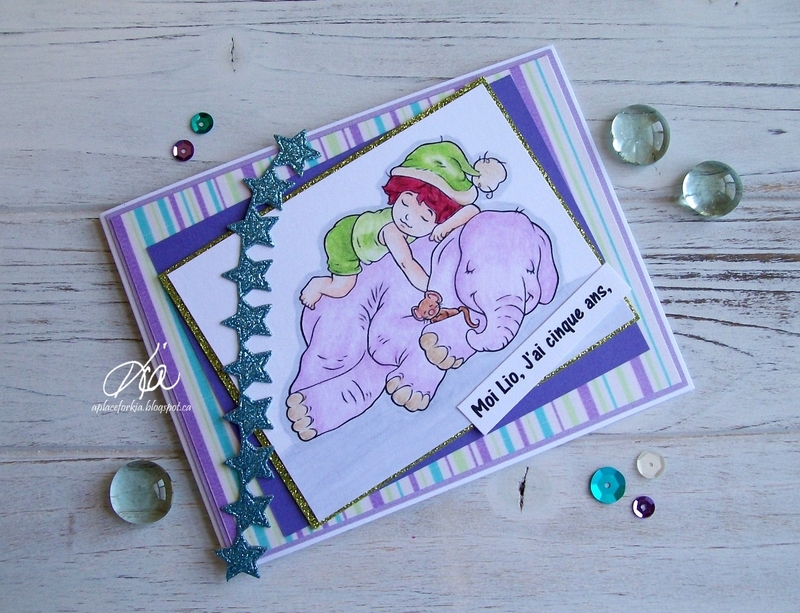 To finish my card I die cut the "hugs" and added embossing ink to it and heat set with the same embossing powder used for my background, and my starfish I did using the same technique as the background. I added sequins and a few dew drops to my finished card. Thanks for having a look, have a great day! Products: Tim Holtz Distress Inks Tumbled Glass, Evergreen Bough, Peacock Feathers, Broken China, Peeled Paint; Ranger Rainbow Sparkle Embossing Powder; Memory Box Deep Ocean Lobster; Impression Obsession Sea Shells; Simon Says Stamp Hugs; Dew Drops; Sequins. A card I did for a challenge at Splitcoaststampers today. 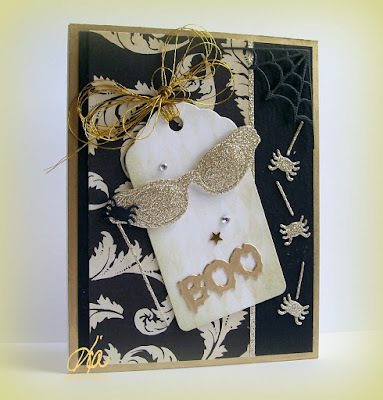 The background is called "ghosting" done using Tim Holtz Distress Inks and Glimmer Mist and an embossing folder. The corner die is a die I have had for some time and has been ignored too long. It is nice to remember those lonely dies every now and then! Thanks for having a peek today. 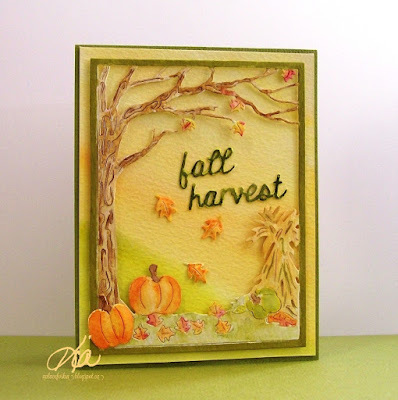 Products: Taylored Expressions Leafy Vine Embossing Folder, Memory Box Madera Corner Die, Stamplorations Noteworth, Sequins, Tim Holtz Distress Inks. 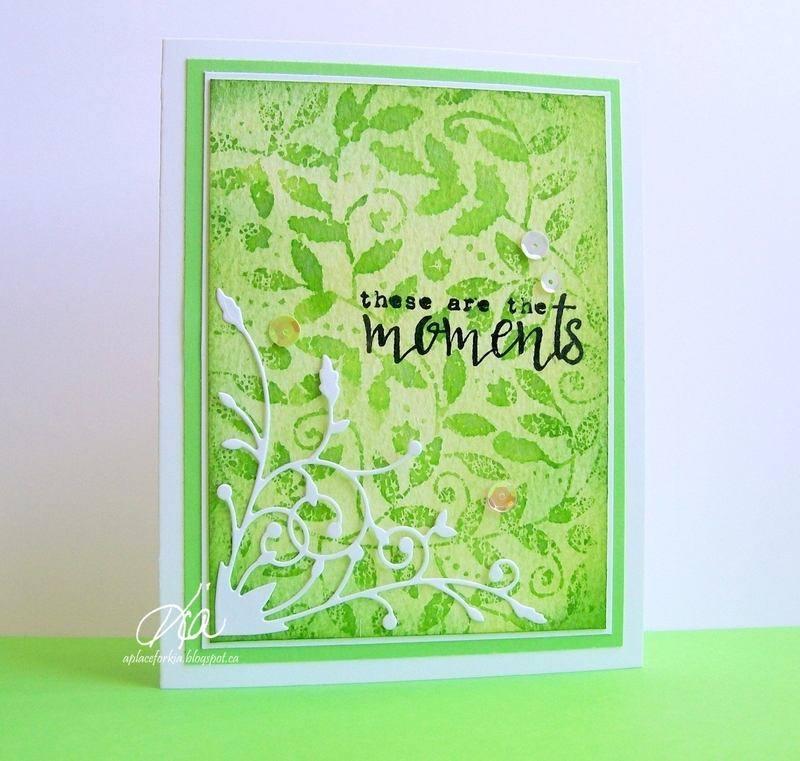 The latest release at Frantic Stamper covered Faith & Sympathy. I readily admit I have a difficult time with this style of card, but I did my best to showcase how very pretty the dies are. I especially love this Calla Lily Stained Glass. I did a separate panel using 40lb vellum for my stained glass, colouring with Spectrum Noir Markers. I added a large Calla Lily along the bottom along with the Love sentiment, and a few butterflies on the inside. As it turned out a customer needed a sympathy card and she picked this card. 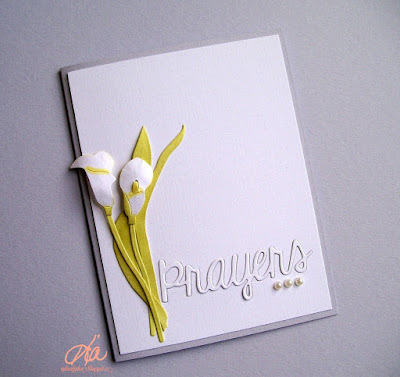 The paper is beautiful, having a textured sheen, and it complimented the Calla Lily die beautifully. I used the Prayers die in both the negative and positive and added a few pearls to finish. Using the Open Book die I made this simple bookmark. 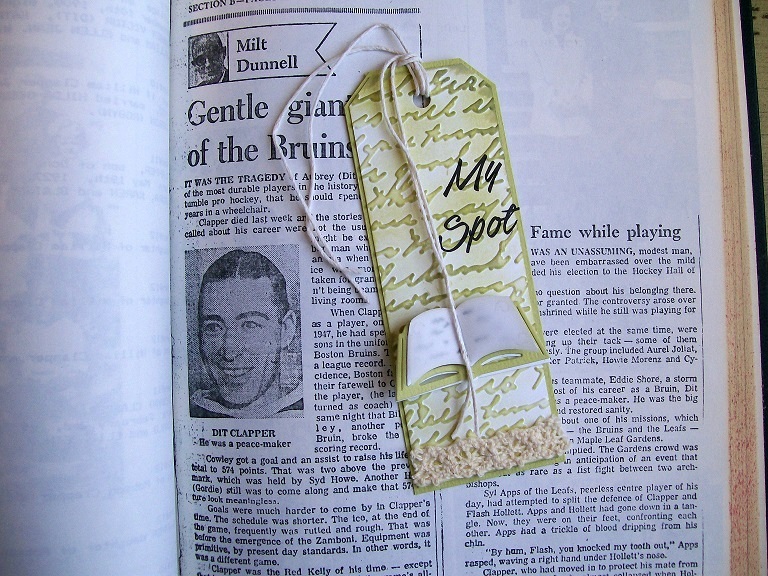 I Printed "My Spot" on cardstock, cut and embossed using my Cuttlebug Script Embossing Folder for my background, sponging the edges with Crushed Olive and adding olive cardstock matting. I added the fringe embroidered lace edge and twine. I added some pages to the book with light vellum. The book is a published book on my family history called Scriver etc. and Dit Clapper was my Grandad's brother - it seemed only fitting to use the bookmark on this page. 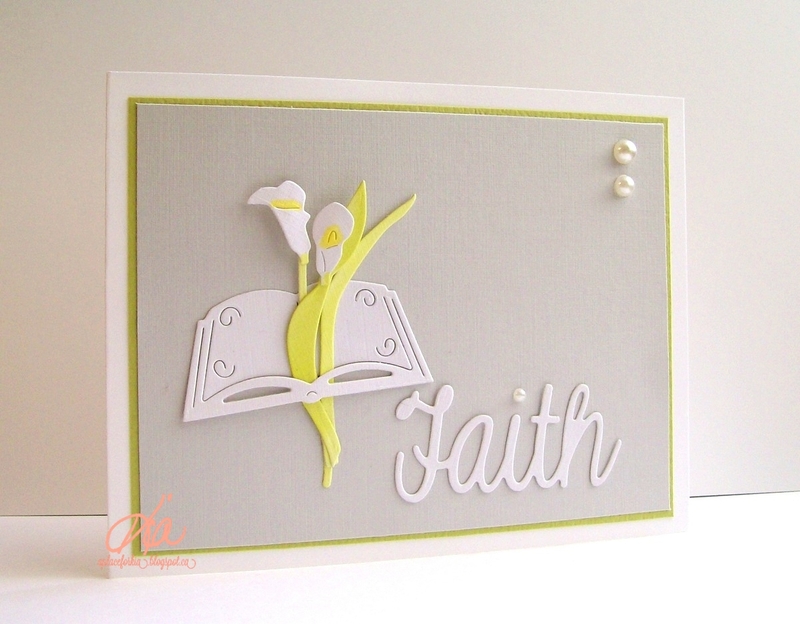 I treated the book die as a Bible for this card tucking the small Calla Lily Die along the centre, and using the Faith sentiment along with a couple of pearls. I wondered about this, but another customer loved it, and away it went. And finally I did this card doing a very different background for the Calla Lily and the love sentiment. 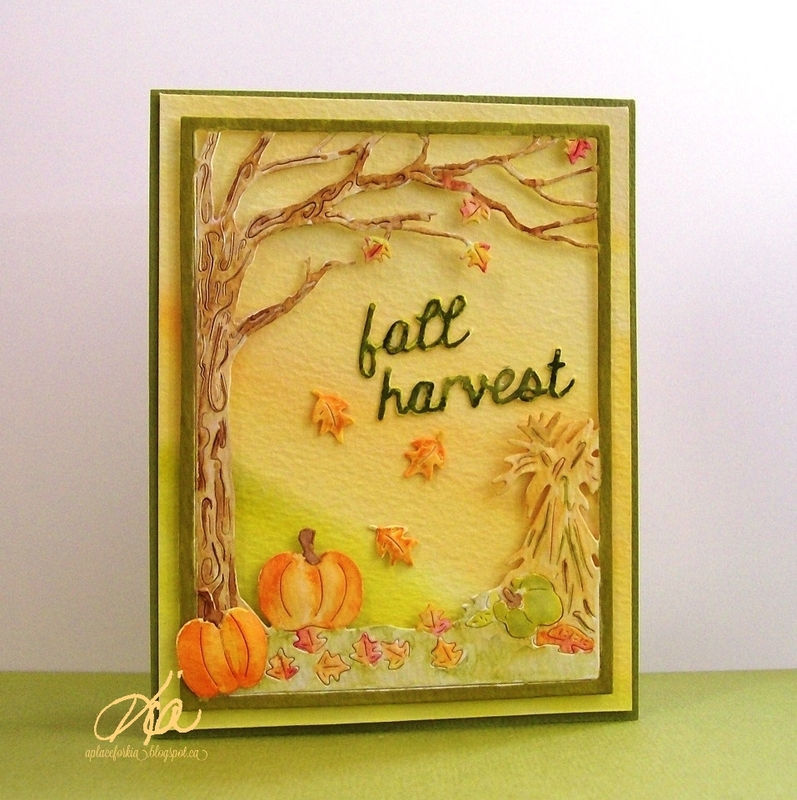 I did the background using Bisters and die cut the Love from foam. On the inside I did the same background and have "You" inside. I really like this, probably because it is very different. Thanks for having a look today. I hope you enjoyed this release by Frantic Stamper. I have the links following for ease of access. Products: All Frantic Stamper - Stained Glass Calla Lily, Large Calla Lily, Faith Words #3, Faith Words #4, Mix n' Match Calla Lilies, Open Book, Petite Butterflies. 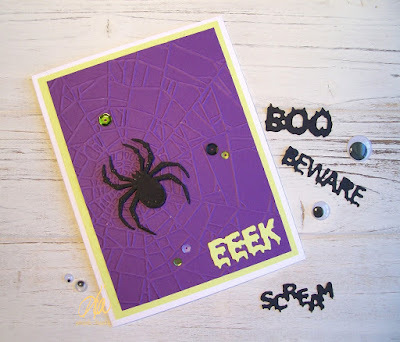 Other Products: Cuttlebug Script Embossing Folder, Memory Box Chevron Stencil, Bisters, Spectrum Noir Markers, Fun Foam, Sequins, Kaiser Pearls, Twine, Embroidered Lace. 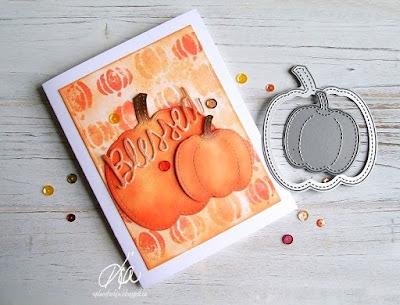 Cool Treats for the Clean and Simple challenge at Splitcoaststampers today. I just bought some yogurt popsicles for myself, and this is where I went with my card. The stacked hearts I sponged with Spiced Marmalade, Wild Honey and Worn Lipstick. The little stitched petal square is left over paper from the card below. I coloured my popsicles with Martha Stewart Glitter Markers and attached them with foam dots, and a few sequins in my colours to finish my card. Great fun. On the inside I die cut 3 different "sweet" dies in the colours, so it makes a great thank you card. Thanks for looking and have a great day! 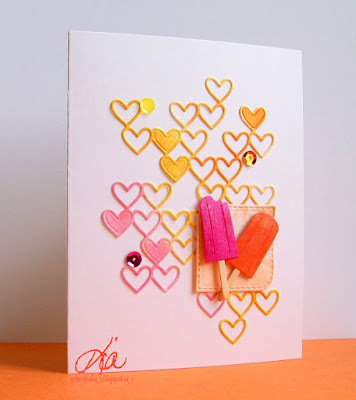 Products: Simon Says Stamp Stacked Hearts, Frantic Stamper Stitched Petal Labels, Frantic Stamper Popsicles, Tim Holtz Distress Inks, Martha Stewart Glitter Markers, foam dots, sequins. Like everyone I am always in need of birthday cards, not only for my friends, but I am in a Birthday Random Act of Kindness Group, so I send birthday cards on a regular basis. 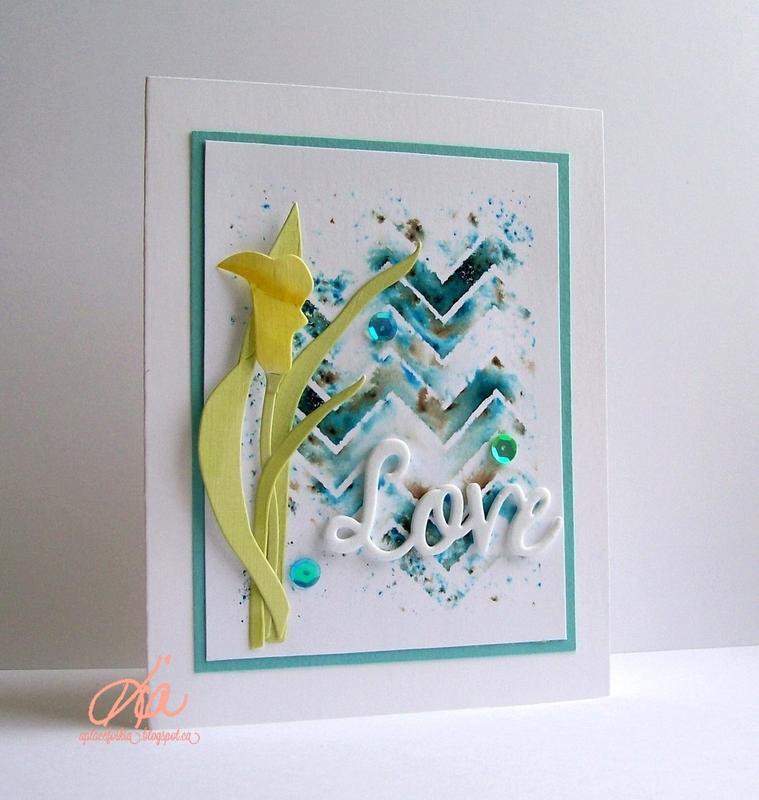 I did this card with some left-over marbling paper I made awhile back. I will explain the technique at the end of this post. 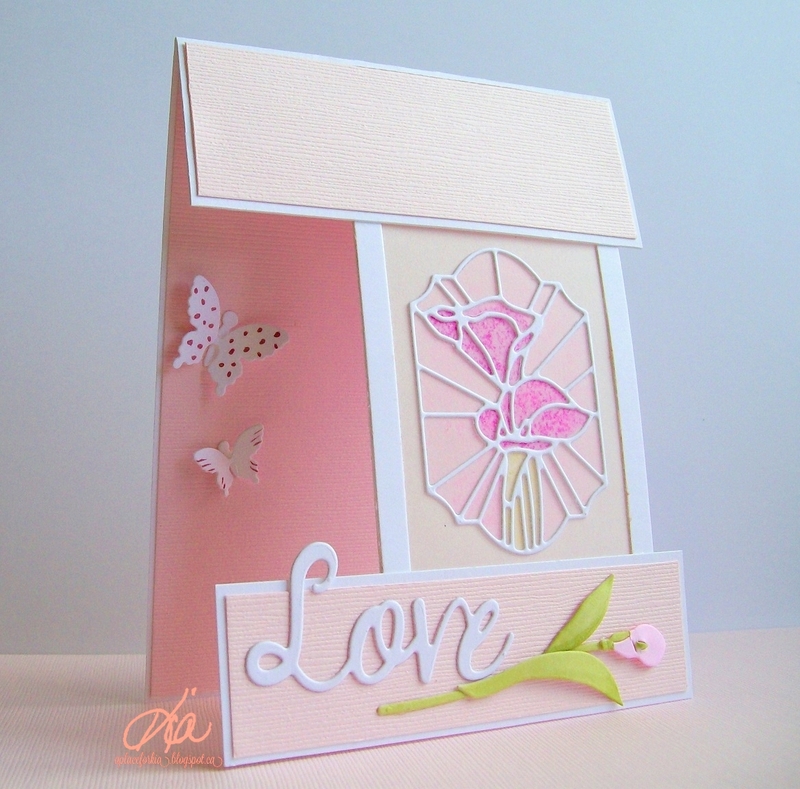 I die cut my little piece of left-over paper using the deckled dies and the floral dies. I did not have enough for my branch, but I like it in the white anyway. I added a tad of distress ink to the edges of my flowers and styled them slightly. The left and bottom flowers are on foam dots and the top right flower is glued to the panel. I added some glitter marker dots to the centre of the flowers and tucked the branch in behind the flowers. 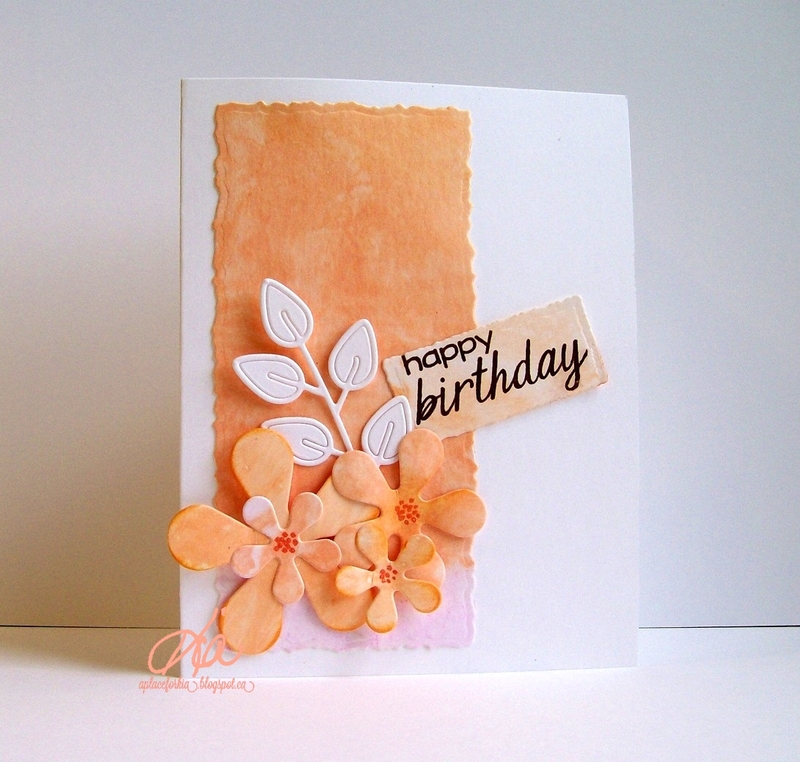 The birthday sentiment is stamped in the black and die cut on the smallest deckled die. I really like the look, and hope you do as well. As to the Marbling technique, all you need for this is alcohol ink. A little water in a flat container, add several drops of the ink and quickly add your paper. I have the paper positioned and ready to dip the minute the drops are added as I seem to get the best results this way. And, I use tweezers to hold my paper as the ink stains. So be sure to have paper towel down for your finished paper. 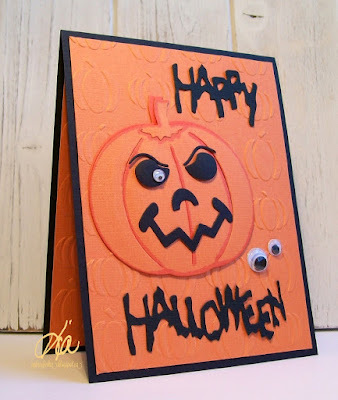 I use heavy cardstock to do this, and I usually make quite a few when I am doing it to get the mess over all at once! 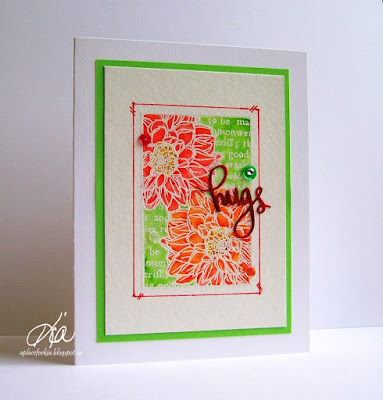 Products: Frantic Stamper Open Spring Sprig, Frantic Stamper Retro Daisies, Frantic Stamper Celebrations Stamp Set, Ranger Alcohol Ink, Tim Holtz Distress Ink, Martha Stewart Glitter Markers, Spellbinders Large Deckled Rectangles. Playing in the garden today with the Inspiration Challenge at Splitcoaststampers. We visited a Pinterest Board all about Napkins. My friends would say "she is in her element" with that Board. I love table settings/decorations and napkins! I picked two different Pinterest pictures for my inspiration. First this napkin which is so cool, and this spring table setting which I love. For my card, I wanted to lighten the background from the picture and did not have the proper ink so I made a spritzer bottle with a small amount of watercolour paint and did the stencil spritzing technique. I then stamped my flower base in ripe persimmon, added the stems in mowed lawn and stamped the flower petals with embossing ink and white embossing powder. I sponged on the ripe persimmon, added yellow marker to the centres and topped with yellow glitter markers. I styled the flowers slightly before adding to my card base, which I matted in the lime green. A sentiment, a few sequins and a yellow pearl finished my card. I really like the results and hope you do as well. Thanks for looking today! 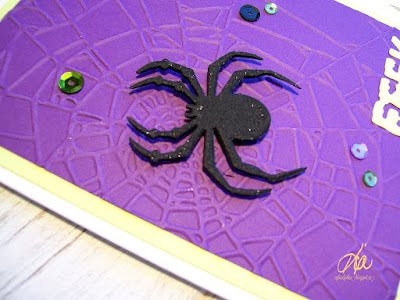 Products: Simon Says Stamp Trellis Grate Stencil, Simon Says Stamp Artful Flowers and Designer Flower Dies, Da Vinci Paint, Tim Holtz Distress Inks, doCraft Markers, Martha Stewart Glitter Markers, Sequins, Kaiser Pearls. 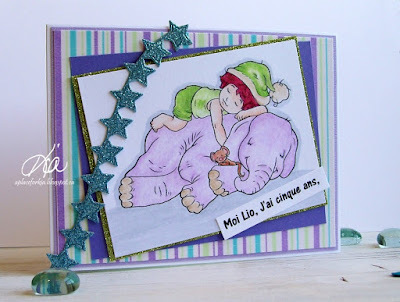 This is for the Mix Challenge at Splitcoaststampers today which is to use a favourite phrase. This is one of my faves, and usually I would have it inside the card, but for the challenge today it is on the front. The background I did using a little stamp set called Hello Friends, which has all these little stamps to use. I coloured them with both Chameleon and Spectrum Noir Markers and there is also Wink of Stella in the mix, but it never photographs well. I stamped the sentiment on vellum with and heat set before die cutting. This was fun to make ... hope you like it. 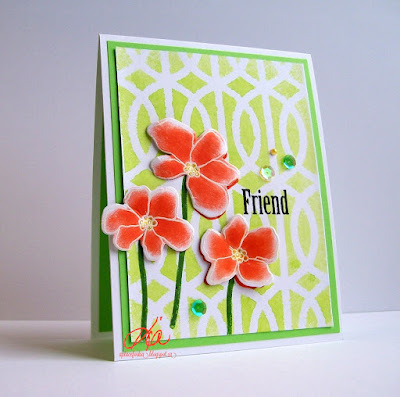 Products: Simon Says Stamp Hello Friends Stamp Set, Stampendous Sentiment Stamp, Frantic Stamper Stitched Petals, Vellum 40lb., Chameleon and Spectrum Noir Markers, Wink of Stella, Tim Holtz Distress Inks Dusty Concord, Sequins.